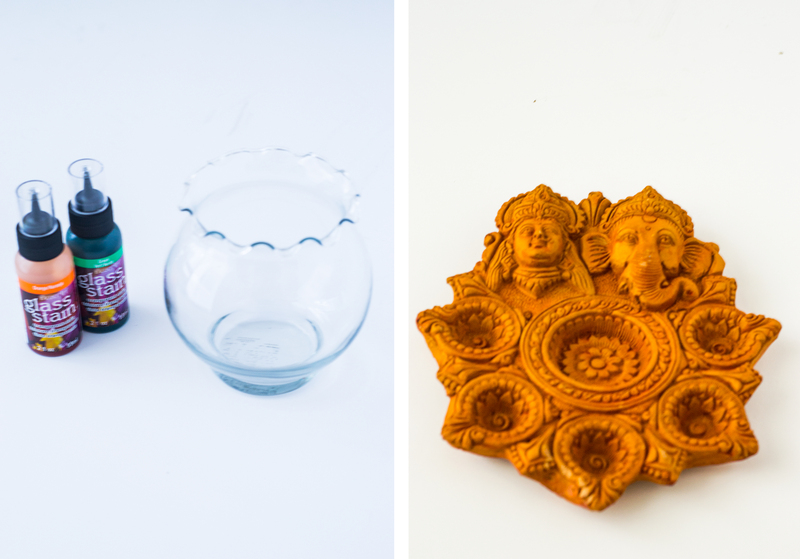 Diwali is just two days away, and I wanted to share three fun ways of diya decorations.All of them are super easy and can be be easily made at home just a day before with few craft supplies. Bangles with Tea light candles – Just add some glass bangles around a tea light holder, and there you have it a great center piece for your Diwali dinner spread. You can add glue to hold the bangles together. Hand painted candle holder – I used a tinted glass paint and painted glass candle holders in two differnt colors. After it completely dried, using the gold dimensional paint, I added the designs similar to Mehendi designs. Drying may take couple of hours. Hand painted store bought diyas – This is the easiest way to add some colorful personal touches. Just buy some diyas and color to them with acrylic paints(my fav) as you wish.